Christmas tree skirt, elfs singing. Permin 45-7268. Christmas tree skirt with elfs with pourage. Permin 45-1218. Christmas tree skirt, round, snowman and santa claus. Permin 45-5228. Round Christmas tree skirt with mushrooms and elfs. Permin 45-2209. Christmas skirt with lights decoration. Permin 45-8246. Christmas skirt with 2 elfs. Permin 45-9242. Round Christmas tree skirts with sweet angels. Permin 45-9240. 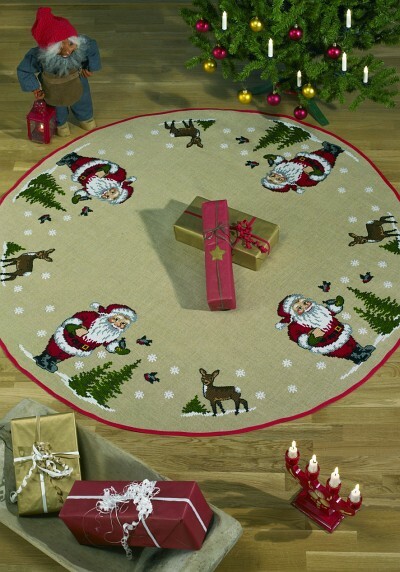 Round Christmas tree skirts with Santa and cats. Permin 45-6211. Christmas tree skirts with dancing Santas. Permin 45-5218. Christmas tree skirts - Santa Claus helper pulling sled. Permin 45-3255. Christmas tree skirts - Santa Claus animals. Permin 45-3254. Christmas tree skirts - Dancing Santa Claus helper couple. Permin 45-0290. Christmas tree skirts - big Santa Claus helper with geese.